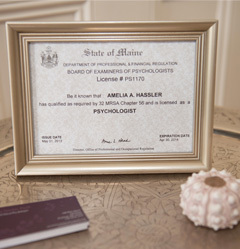 I am a doctoral level psychologist licensed in Maine and Massachusetts, and I am a member of both the American Psychological Association (APA) and the Maine Psychological Association (MEPA). I hold a PsyD degree in Clinical Psychology from the APA accredited doctoral program at the Massachusetts School of Professional Psychology in Boston, Massachusetts. I completed all my graduate education, training, and post-doctoral work in the Boston area and have trained at three of the major hospitals affiliated with Harvard Medical School. In the past, I was appointed as a Clinical Fellow in Psychology at the Massachusetts General Hospital/Harvard Medical School in Boston, and as a member of the medical staff at Mercy Hospital in Portland, Maine. I have over 20 years of clinical experience working with a wide range of mental health, personal & relationship issues, and have been trained in the use of various short & long-term treatment modalities. Currently, I am greatly enjoying my Private Practice in Portland, Maine, where I have been practicing for the past 13 years.